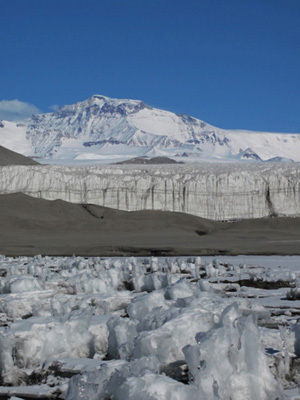 The new study demonstrates that old organic matter in sedimentary basins located beneath the Antarctic Ice Sheet may have been converted to methane by micro-organisms living under oxygen-deprived conditions. 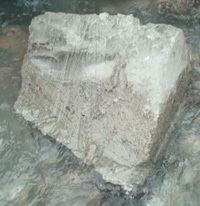 The methane could be released to the atmosphere if the ice sheet shrinks and exposes these old sedimentary basins. Coauthor Slawek Tulaczyk, a professor of Earth and planetary sciences at UC Santa Cruz, said the project got its start five years ago in discussions with first author Jemma Wadham at the University of Bristol School of Geographical Sciences, where Tulaczyk was on sabbatical. "It is easy to forget that before 35 million years ago, when the current period of Antarctic glaciations started, this continent was teeming with life," Tulaczyk said. "Some of the organic material produced by this life became trapped in sediments, which then were cut off from the rest of the world when the ice sheet grew. Our modeling shows that over millions of years, microbes may have turned this old organic carbon into methane." The science team estimated that 50 percent of the West Antarctic Ice Sheet (1 million square kilometers) and 25 percent of the East Antarctic Ice Sheet (2.5 million square kilometers) overlies pre-glacial sedimentary basins containing about 21,000 billion metric tons of organic carbon. "This is an immense amount of organic carbon, more than ten times the size of carbon stocks in northern permafrost regions," Wadham said. "Our laboratory experiments tell us that these sub-ice environments are also biologically active, meaning that this organic carbon is probably being metabolized to carbon dioxide and methane gas by microbes." The researchers numerically simulated the accumulation of methane in Antarctic sedimentary basins using an established one-dimensional hydrate model. They found that sub-ice conditions favor the accumulation of methane hydrate (that is, methane trapped within a structure of water molecules, forming a solid similar to regular ice). They also calculated that the potential amount of methane hydrate and free methane gas beneath the Antarctic Ice Sheet could be up to 4 billion metric tons, a similar order of magnitude to some estimates made for Arctic permafrost. The predicted shallow depth of these potential reserves also makes them more susceptible to climate forcing than other methane hydrate reserves on Earth. Coauthor Sandra Arndt, a NERC fellow at the University of Bristol, who conducted the numerical modeling, said, "It's not surprising that you might expect to find significant amounts of methane hydrate trapped beneath the ice sheet. Just like in sub-seafloor sediments, it is cold and pressures are high, which are important conditions for methane hydrate formation." If substantial methane hydrate and gas are present beneath the Antarctic Ice Sheet, methane release during episodes of ice-sheet collapse could act as a positive feedback on global climate change during past and future ice-sheet retreat. "Our study highlights the need for continued scientific exploration of remote sub-ice environments in Antarctica, because they may have far greater impact on Earth's climate system than we have appreciated in the past," Tulaczyk said. This research is a collaborative venture between the University of Bristol (UK), The University of California, Santa Cruz (USA), The University of Alberta, Edmonton, and the University of Utrecht (The Netherlands). It was funded principally by the Natural Environment Research Council (UK), the Leverhulme Trust (UK) with additional funds from the National Science Foundation (USA), the Natural Science and Engineering Research Council of Canada and the Netherlands Organization for Scientific Research (NWO).